Pediatric scoliosis is a condition that causes a child's spine to curve. A child's spine that is affected by scoliosis will show evidence of lateral or side-by-side curvature, with the spine looking like an "S" or "C" and a rotation of the vertebrae (back bones), giving the appearance that the child is leaning to one side. The Scoliosis Research Society defines scoliosis as a curvature of the spine measuring 10 degrees or greater. According to the National Institute of Arthritis and Musculoskeletal and Skin Diseases, 3 to 5 out of every 1000 children develop spinal curves that are considered large enough to require treatment. Spinal curvature from scoliosis may occur on the right or left side of the spine, or on both sides in different sections. Both the thoracic (mid) and lumbar (lower) spine may be affected by scoliosis. Scoliosis is a type of spinal deformity and should not be confused with poor posture. Infantile: This type of scoliosis occurs from birth to age three. The curve of the vertebrae is to the left and it is more commonly seen in boys. Typically, the curve resolves as the child grows. Juvenile: Juvenile scoliosis occurs in children between ages 3 and 10. Adolescent: This type of scoliosis occurs in children between ages 10 and 18. This is the most common type of scoliosis and is more commonly seen in girls. Scoliosis is a type of spinal deformity and is not a result of poor posture. Scoliosis is a problem that makes the spine curve and twist from side to side. 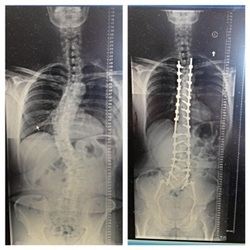 For most of his childhood, Rob Crane suffered from scoliosis. For years, he wore a brace 23 hours a day to try and straighten his spine, but, as an adult, the disease returned.